8th to 11th June 2018, Barcelona, Spain. The European Society of Hypertension (ESH) is developing an outstanding scientific programme that will include multiple State-of-the-Art Lectures, Debates and Round Tables on issues on major current interest and controversy. As in the past, the program will reserve a wide space to the practical aspects of the management of hypertension via Teaching, How-to, Meet the Expert and Clinical Case Sessions as well as via sessions reserved to hypertension specialists and ESH Excellence Centers. An important contribution will also come from Satellites organized by the Industry. 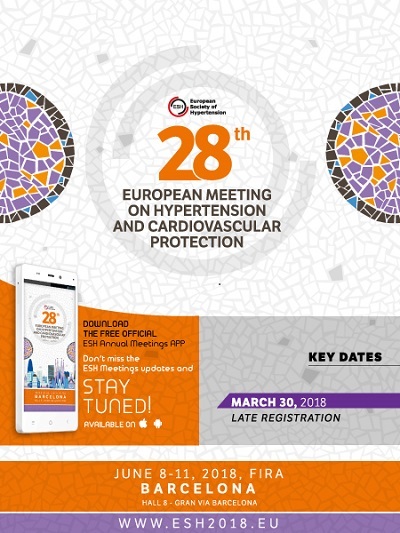 This international meeting will enhance your practical and theoretical knowledge and provide you with the unique opportunity to network with a wide range of professionals in the fields of Hypertension and Cardiovascular Protection. Registration & Fees: Register online. Published in GI-Mail 02/2018 (English edition). Sign up for GI-Mail here.